BOSTON (AP) Kyrie Irving makes spinning baskets off the dribble and converts drives in the lane while leaning in all sorts of different directions. It’s the simple jump shot that earns praise from Boston coach Brad Stevens. 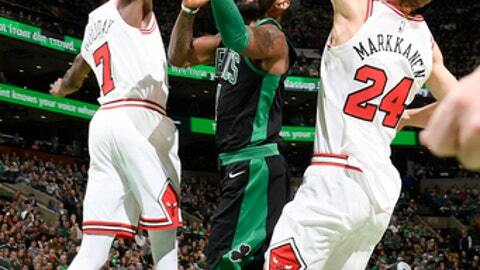 Irving scored 25 points, Jaylen Brown had 20 and the Celtics coasted to a 117-92 victory over the Chicago Bulls on Saturday night. Well known for his acrobatic moves, Irving shot 9 for 15 from the floor against Chicago – including 5 of 7 from beyond the 3-point line. Thanks to Irving’s sweet shooting, the Celtics (27-9) halted a two-game skid. They haven’t lost three straight all season. Jayson Tatum added 13 points, and Al Horford and Aron Baynes each had 10 for the Eastern Conference leaders as all five Celtics starters were in double figures. Reserve guard Marcus Smart scored 11 points and rookie Daniel Theis grabbed a season-high 15 rebounds to go with 10 points. Bobby Portis paced the Bulls (10-22) with 17 points. Robin Lopez and Lauri Markkanen both scored 10. Chicago lost its second straight after a seven-game winning streak. The Celtics avenged a lopsided defeat in Chicago on Dec. 11, when they lost by 23. Irving didn’t play in that game because he was rested. ”We knew they were going to come out and try and be aggressive because of that,” said Bulls guard Kris Dunn, who went 1 of 12 from the floor. Boston shot 5 of 7 from beyond the arc in the third quarter and outscored the Bulls 38-18. Brown nailed a pair of 3-pointers and scored seven points as the Celtics opened the third with a 13-2 run, pulling out to a 73-60 lead. After the teams alternated baskets for a couple of minutes, Boston took charge by scoring 15 of the next 19 points. Irving had a pair of 3s during the run and Tatum added one. Boston led 98-76 after three. Chicago missed 12 of 18 shots overall in the third and committed six turnovers. Bulls: Had scored 100 or more in eight straight games. … Portis scored 15 points in 11 minutes during the opening half, including six straight. … Chicago didn’t commit a foul in the opening quarter until the final minute. … Dunn, who played nearby at Providence College, got a nice ovation during pregame introductions. Celtics: Brown was back in the lineup after missing the previous game with a sore left Achilles. … Boston made 13 of its first 18 shots, missed 11 of 16 and then hit six of nine. During a postgame interview on the court, Irving talked about how much he’s enjoying playing in Boston. ”It’s a feeling that I can’t wait to get used to for a long time,” he said. The star guard was acquired during the offseason from Cleveland in a blockbuster deal between the Eastern Conference finalists last season. Chicago guard Jerian Grant slipped to the floor in the closing seconds of the third just inside the foul line to the right of the lane. When no one got up close to him, he flipped a scoop shot that went in as the buzzer sounded. Stevens talked glowingly before the game about the Bulls’ team speed when he watched them on film. ”They were flying around, moving the ball,” he said. Bulls: At the Milwaukee Bucks on Tuesday. Chicago won in Milwaukee on Dec. 15 in the only other game between the teams this season. Celtics: Host the Washington Wizards on Christmas Day. It’s their first meeting since their seven-game series that was won by Boston in the second round of the playoffs last spring.